The Southern Brooklyn pols are trying to nix bus lanes planned for the B82, one of the slowest bus routes in the borough. DOT and the MTA are working to speed up bus service on the B82, which carries 28,000 daily trips across southern Brooklyn but averages less than 7 mph. Standing in the way are six Brooklyn pols who are trying hard to stop improvements that will make life better for their bus-riding constituents. 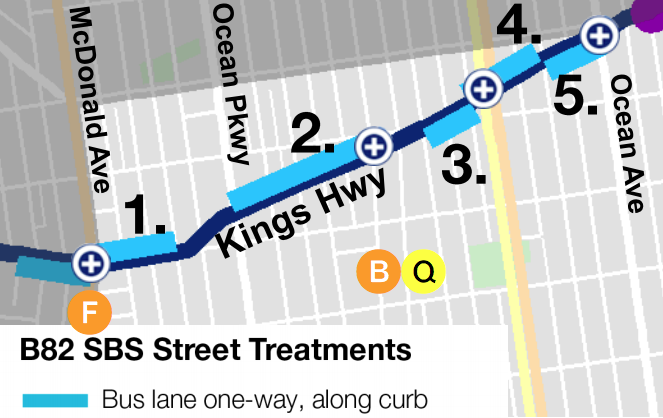 The plan for B82 Select Bus Service calls for bus lanes along Kings Highway, slated for implementation this spring. The B82 is one of Brooklyn’s slowest, least reliable routes and in dire need of improvement. Nearly one in every five B82 buses arrive in bunches, and only 48 percent arrive on time, according to the Bus Turnaround Campaign. DOT has mapped out the segments where the B82 moves the slowest — that’s where bus lanes are coming. At least, that’s where bus lanes will be implemented if the city withstands the protestations of Republican State Senator Marty Golden and five Democrats — State Senator Simcha Felder, City Council members Mark Treyger and Chaim Deutsch, and Assembly members Steven Cymbrowitz and Dov Hikind. On narrower blocks of Kings Highway, the DOT plan would repurpose 134 parking spots for bus lanes that will be in effect on weekdays from 7 a.m. to 10 a.m. and 4 p.m. to 7 p.m. [PDF]. Outside of those times, the curb would still be reserved for car storage. To those six elected officials, those parking spaces are more important than faster, more reliable bus service for tens of thousands of people. Then earlier this week, the five Democrats echoed Golden in comments reported by Kings County Politics. But experience has disproven the old scare tactic about bus improvements undermining local business. On Fordham Road in the Bronx, retailers saw more growth in sales after the launch of Select Bus Service, which repurposed curbside parking, than the borough as a whole. Most people aren’t driving to shop on Kings Highway either. DOT and MTA surveyed 7,500 people out on the street and found that more than three quarters of them came by transit or walking, not by car. Even so, to assuage concerns about parking, DOT and the Kings Highway BID tasked traffic engineer Sam Schwartz with adding 21 parking spots in the area. The B82 was one of 16 bus routes in Brooklyn that received an “F” in the bus report cards released last month by the Bus Turnaround Coalition. The route provides an essential connection across southern Brooklyn. There is no train that serves those trips — tens of thousands of people riding the bus have to stew in traffic with single-occupancy vehicles. People will still be able to shop on Kings Highway after bus lanes are installed. If anything, once buses that can carry 50 people prove to be faster and more reliable, more customers will be able to reach those businesses than with a handful of cars clogging the curb. Just becuase we walk to the corner to shop doesn’t mean we are the only ones that shop on Kings Highway .It means we are LUCKY.Second of all if we do take our car out we usually come back to shoppers blocking our driveways for hours at a time while they do their errands and go for lunch . Outreach ??? With false surveys and information ? Which 7500 people did they interview ???? MOVE THE BUSES AND BUS STOPS TO AVE P WHICH HAS 3 LANES . THEY NEED TO BE ON A STREET THAT 3 LANES .We are the ONLY area in Brooklyn that has 2 bus stops directly across from each other !!!! What are we supposed to do with all our groceries and packages ? Nobody stand on the bus stop on my corner ever . Share what ? My parking space ? I own 3 houses and have 3 cars and 6 bikes and built myself a garage .I shovel all my private driveways and sidewalks gladly .I walk every day and patronize all my neighborhood shops forever..worry about someone besides you !!! Boo hoo yourself . The bus runs along Kings Highway because it’s the main commercial corridor. You’re more than welcome to park on Avenue P and walk from there. You may find that offensive but that’s no less offensive then demanding that the bus riders, for whom you have nothing but contempt, walk from Avenue P.
3 houses? Tiny violin here. “My parking space” No, not your parking space. The curbside space along Kings Highway. It’s much more beneficial to the community at large if the curbside space was allocated towards buses and not towards private car storage. Leaving it as private car storage automatically limits who can use it. I can’t drive and park on Kings Highway because like the majority of Brooklyn residents, I do not own a car. It’s as if these people don’t exist to you. You can see them in this video. They deserve better buses and they deserve it at the expense of car parking. Just move it to a wider throroughfare that’s a block away . Who buys one week of groceries at the same time? I often do, and walk them home using a hand cart. But the stereotypical demographic is suburbanites (even if they happen to live in Brooklyn) who transport the groceries in their SUV. If you want parking, build a garage. Stop expecting everyone else to pay to provide it to you. If anyone actually went to the townhall meeting discussed this proposal they would have seen that 99% of the people were in opposition of this plan, myself included. As public transit user this would not fix anything. The express bus lane would save people a maximum of 5 minutes but would hurt countless businesses & their employees who use that income to pay their bills. If you look at the study posted above only 1/4 of the people get to kings highway by public transit (buses & trains). Break that down further that’s only 1/8 of the people use the bus vs 7/8 of the people who this an would not benefit fit &/or hurt; need to put the majority of the people first. The real problems is that there are always 3 buses within a block of each other instead of running with regular intervals between them. In addition ticketing illegally parked cars would solve the entire matter without hurting anyone and benefiting the city. As a business Owner here for 46 years, This Will Kill Business all along kings highway. There is already enough shops changing in and out of business here. there is only 1 lane and a parking lane. If you take up the parking lane for buses where will customers park? it is hard enough currently. I have been on kings highway for 46 years!!! Why not Choose AVE P!!!!!!!!!!!!!!!!!!!!! It is the more logical. It is a 4 lane ave. it has 2 driving lanes and a parking lanes in both directions. that Avenue can spare a lane for the buses!!!! Psst! Many of your customers already arrive by bus, despite the slow and unreliable service. Less than 25% of people traveling to Kings Highway arrive by car. People on buses take up far less space than people in cars – if bus service is improved, even more people will find the bus useful, while if bus service deteriorates, more people will drive, making it even harder to find parking than it is now. Do you, personally, drive to work? If so, you could start using the transit system and free up one parking space on or near Kings Highway for your customers’ use. And you could reward your employees for doing the same, freeing up even more parking spaces for your customers’ use. But I have a hunch this isn’t about your customers at all and is entirely about you. I have a hunch that you drive to work, perhaps illegally feeding the meter all day, and you’re upset that the new bus lane will interfere with your own commute choice. If that’s the case, I suggest you start thinking about how the B82, or the other transit services in the area, can get you to work. Psst Quasimodo with your Hunch. I live Close. 20 min walk. I have a bicycle, i have a fast electric scooter, i have a vespa and a reserved corner spot. All much faster then car, even walking!!! This is a jewish neighborhood. families with 8 kids with 8 cars. they drive. Quasi, how do you know my customers? You Said ” Many of your customers already arrive by bus”. How Do you know my area as i mentioned? Ocean ave to Ocean Parkway. Did you yourself take this survey in my neighborhood and were you infront of our stores? The Reason Being is i have a nest camera that records 24/7 and currently conducting my own survey 9?18?18. Off the bat, 3 customers by car and 1 walk. I will continue through out the day with this survey. Also i didnt say eleminate the bus lane i proposed it be diverted to the 4 lane ave P. It can afford to lose a lane and there are no business in that area. I welcome you to review my survey video at anytime. Just let me know when you want to come down. By the end of editing this post i have 2mass transit, 5 walkers, 6 car. Will DOT and the MTA Prioritize Parking Over Tens of Thousands of B82 Riders? 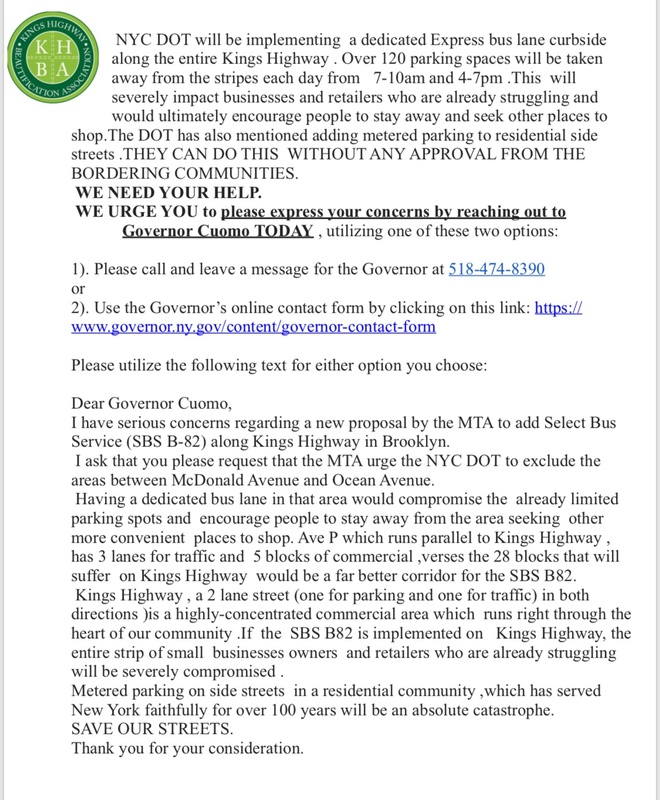 It looks like the MTA and DOT are altering the plan for B82 Select Bus Service to appease electeds who don't want room for bus riders on Kings Highway. 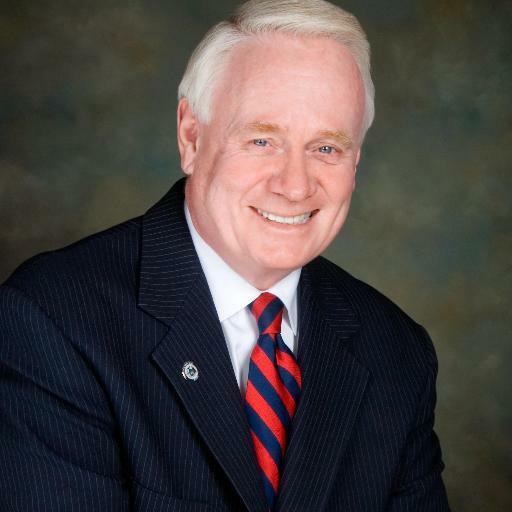 Why do elected officials get to tell the DOT and the MTA that parking is more important than transit? Bus lanes are "anti-women," Colton says, oblivious to the fact that most bus commuters in Brooklyn are women.